This fast-paced and wide-ranging Computing degree will prepare you for a rewarding career in any number of industries. Why Study Abertay's BSc (Hons) in Computing? Explore systems architecture, programming design, coding, platform technologies, software engineering and other areas of computer science on this fast-paced and wide-ranging degree that prepares you for a rewarding career in the computing industry. In an industry where new hardware, software and production technologies are emerging at breakneck speed, computing experts with the ability to apply creativity to existing and future problem areas are in high demand. This practical programme focuses on software development for mobile, desktop and web platforms, with emphasis on constructing effective, efficient, robust, and maintainable solutions. Our computing degree is designed to equip you with high-level subject-specific knowledge, as well as the practical and transferable skills you need to gain a foothold in the computing industry or proceed to further advanced study. This programme is regularly reviewed to keep up-to-date with current professional technologies. Please note: All applicants must have a pass Maths - National 5 grade C or GCSE grade C/4. National 5 Lifeskill Maths not accepted in lieu of Maths. Computers are ubiquitous in the modern world. They're used in all aspects of work and life, and are constantly evolving. This programme is designed to provide you with all the knowledge and skills to enter the industry, regardless of your prior experience. An introduction to the core ideas of computer architecture for students studying the subject of computing, building a mental model of the functioning of a typical computer system that can be used to reason about system (hardware/software) behaviour. An understanding of software development through learning to design and implement applications in C++. This module covers the fundamentals of classes and objects, including key features such as class descriptions, constructors, methods and field, together with method implementation through assignment, selection and iterative control structures. This module complements the programming modules that students take at Level 7 by introducing, in a practical rather than theoretical way, some of the fundamental ideas of software engineering, enabling students to develop and communicate designs for small and large scale software systems. An introduction to the standard data structures and algorithms that form the core of algorithmic thought in computer science that familiarises students with the idea of reasoning about the behaviour and performance of a computer programme. Learn to review, develop, critically evaluate and implement designs of object-oriented software and relational databases. In both these contexts, you review existing designs, develop your own designs to meet stated requirements, critically evaluate them and create example implementations. Module content includes: entity relationship (ER) modelling; relational database design; SQL; OO software and SQL; development methodologies such as waterfall, RAD, agile, TDD. An introduction to some of the practical performance concerns in the selection and implementation of algorithms, using a range of case studies drawn from typical real-world applications. Provides students with the ability to review, critically evaluate and apply software engineering practice in the development of object-orientated software solutions. Working within a team, students will learn about project management concepts that enable them to create a project proposal in a professional manner and present their work in a client pitch to a stakeholder. Project briefs are provided by industry/or research based problems. Students work within their team and interact with project stakeholders and gain an understanding of the principles of project management. This module involves completing a team based development project or other technical investigation project, which was planned and initially developed in CMP308 (Professional Project Planning and Prototyping). Students are provided with the opportunity to propose and plan a major, in-depth individual project in an aspect of their programme to develop and exercise research skills and to encourage self-managed learning, planning and professional competence. Students are provided with the opportunity to undertake the practical and development work for a major, in-depth individual project in an aspect of their programme. During term 1 proof of concept development will be undertaken to support the specification of a well-researched project proposal document. During term 2 the main development work for the project will be undertaken and completed. Students are provided with the opportunity to present a major, in-depth individual project in the form of a dissertation in an aspect of their programme. The dissertation involves presenting the work in a structured and coherent manner which allows for critical and insightful review and evaluation. You’ll spend between 12 and 16 hours per week in lectures, tutorials and computing lab-based practical activities. Lectures are used to present the key concepts, theories and techniques throughout the course. Tutorials and lab-based activities increase your understanding of the subject and allow you to develop your competence and confidence in technological and theoretical work. During the course, you’ll also participate in team-based activities, including a group project in year 3 where you’ll specify, plan and implement a software product. Throughout the programme, there’s a mixture of coursework, project, class test and closed-book examinations. Approximately 20% of assessment is by examination. There’s a constant demand for graduates who can show proven ability to design, build and support software systems and develop computer applications that are effective, efficient and contribute to organisational success. … as well as smaller, local companies such as MTC and Brightsolid. Computing graduates are employed, for example, as software developers, software testers, web developers, system analysts, and technical consultants. Many of our graduates have also gone on to postgraduate study. Links with industry take place throughout all years, but especially in years 3 and 4. Speakers from the computing industry will give guest lectures. 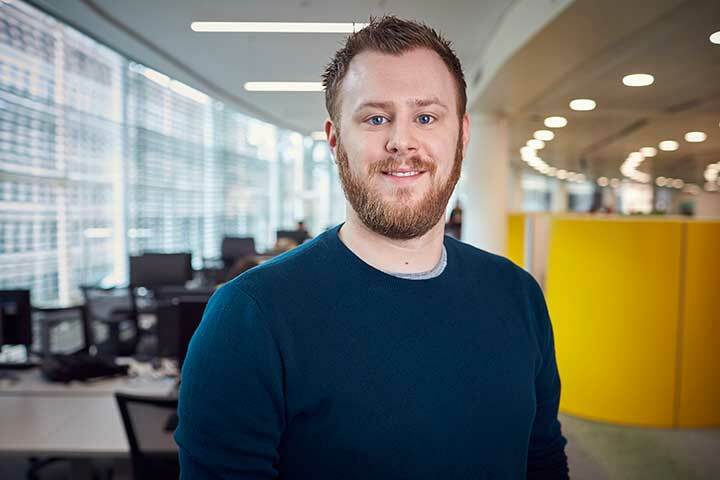 Ben is on the two year Software Engineering Graduate Scheme at the BBC. Fraser is Director of Engineering at Cherwell Software. Drew has built up a large online following, he’s also Head of Computing at Brampton College.